So your little guy or gal is all about the action-packed fun from Kong Skull Island. Great! But there's a little problem. You just don't think that you're going to be able to bring the over-sized action to life for Halloween. But, really, it's not a problem. You can get your kid this child inflatable King Kong costume, and they'll be ready for anything Skull Island can throw at them! Mysterious skull crawlers? No match for Inflatable King Kong! A squadron of military copters invading the island? Inflatable King Kong will swat them out of the sky! Trying to score a giant ape-sized load of trick or treat candy? Inflatable King Kong is ready for action! That's right, your kid will be ready for all the action and more. All we gotta do is suit them up for the fun. This inflatable costume will do the trick, with aplomb! This costume is made of polyester windbreaker-like material. It secures in the back with a back zipper, and elastic cuffs at the wrists and ankles. You see out through a mesh section in the mouth, and the tall head makes the costume look pretty intimidating when fully inflated. The suit is powered with a battery pack that can be clipped to a belt or kept in a pants pocket, and with 4 AA batteries powering the fan unit, this delightful costume will stay inflated for all the fun. 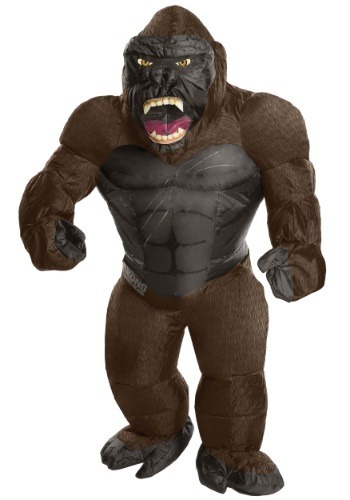 It even has the Skull Island movie logo printed at the waist, so we're sure this Inflatable King Kong costume is sure to be a smash hit this Halloween! Your child will love bringing the hit action of Kong Skull Island to life with this officially licensed costume. Of course, we've got all kinds of other movie monsters and creatures available, too, so we can outfit your whole fam with awesome choices. Browse our entire selection, and get ready for some fun!